Out of the many exceptional restaurants in Singapore, so far it is only Iggy's at the Hilton Hotel which has made it to the list of S. Pellegrino World's 50 Best Restaurants. So I was ecstatic to be trying this out for the first time during my birthday dinner celebration with the husband. 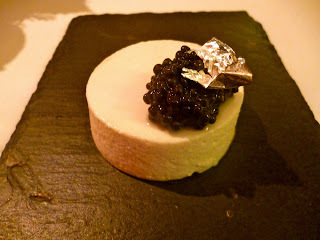 For dinner, they only serve a degustation menu worth SGD 250.00. This is an 8 course meal served with 2 complementary dishes/ amuse bouche at the start. I would best describe Iggy's cuisine as Asian Fusion as you will see a lot of Japanese and Chinese elements in the menu. We were served with our first Amuse Bouche, which were different types of sushi-like creations. Instead of rice, the center was filled with what seemed like a salty meringue. I could not really tell what it was but thought it was a unique twist to your typical sushi. The second Amuse Bouche was an oyster plate with different greens and watermelon. I thought this tasted rather ordinary after the first amuse bouche. 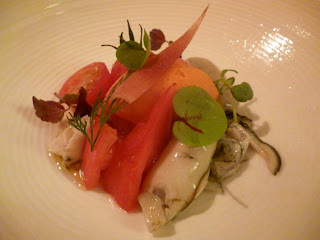 The first of the degustation menu was the Eel, Avruga, Yuzu, Silver. I only understood eel and silver and have no idea what the rest of the ingredients in the menu were. I thought our waiter could have done a better job of explaining this dish. That being said, I though this was very well executed - there was a perfect balance between the subtle texture and flavor of the eel mousse and distinct aromatic flavor of the hickory wood that was used to smoke the dish. I finished this up in seconds! The next dish was Chlorophyll, Sea and Soil. This was a combination of different sea and land/ soil plants. 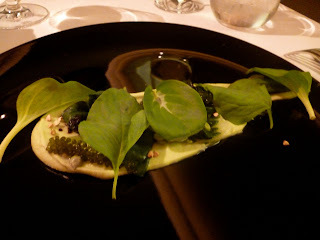 There was a pureed edamame at the base topped with seeds, sea grapes, and other greens I could not identify. The waiter explained that this was made without any seasoning and all the flavors were inherent to the plants itself. I was afraid this would taste too "organic", but I was surprised that this dish was actually genius. The land/ soil plants which are normally on the bland side were flavored by the salty sea plants. The seeds added a nutty texture which made every spoonful of this dish enjoyable. Next was the Kinmedai, Seasonal Vegetables, Sudachi. 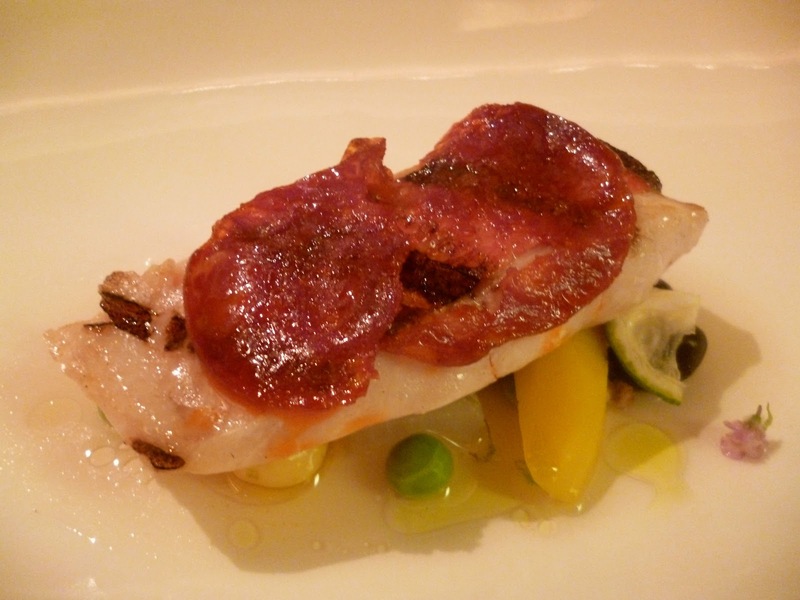 This was a snapper on a bed of vegetables and citrus sauce topped with thin slices of chorizo. I liked the quality and taste of the individual ingredients used in this dish, but I didn't necessarily think they formed one cohesive dish. The last seafood dish was the Sea Urchin, Cauliflower, Abalone, Shiso. I thought the sea urchin was extremely fresh. I also loved the texture that the abalone brought to this. Overall a very pleasant flavor. 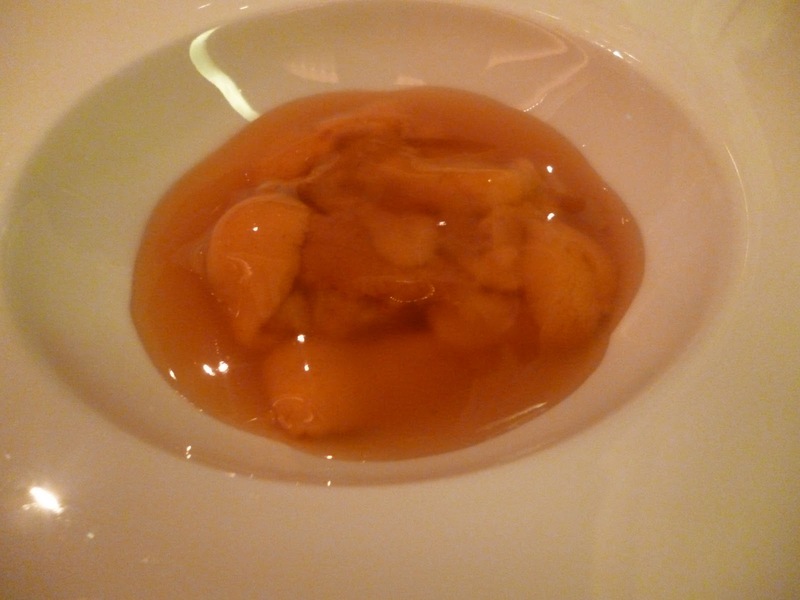 We were then served the Alba White truffles, Tajarin, Poultry Jus, Parmesan. The strong aroma of white truffle gave me a warm and cozy feeling. 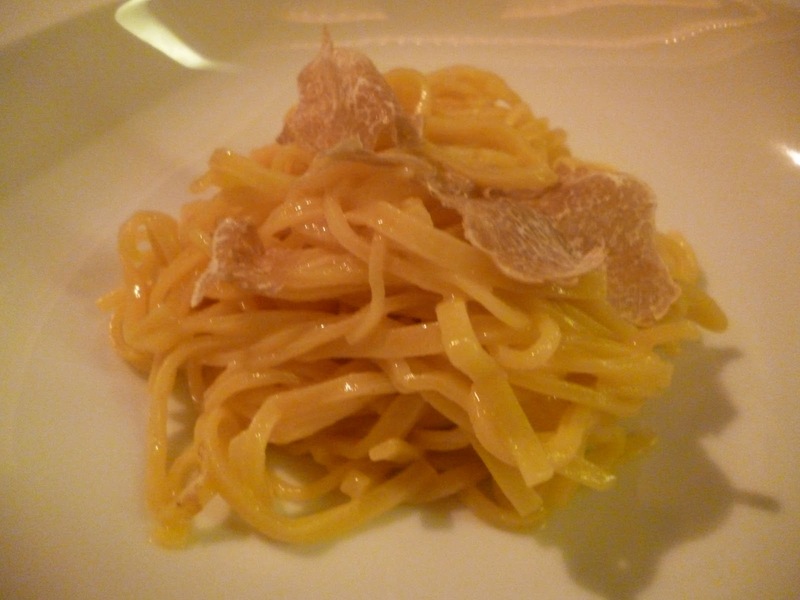 I am in love with anything laced with white truffle. The pasta was very simple mixed with only butter and parmesan, which really put the scent and flavor of the truffle as the star of the show. 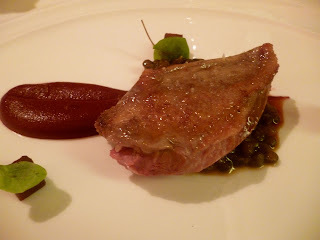 The last of the savory dishes was the Pigeon, Hickory, Beetroot, Lentils. I thought the pigeon was a little tough. The beetroot puree was too bitter for my taste. This was forgettable, and I was honestly expecting a more smashing hit for the last entree. The first dessert was Cantaloupe, Raspberry, Peppermint. 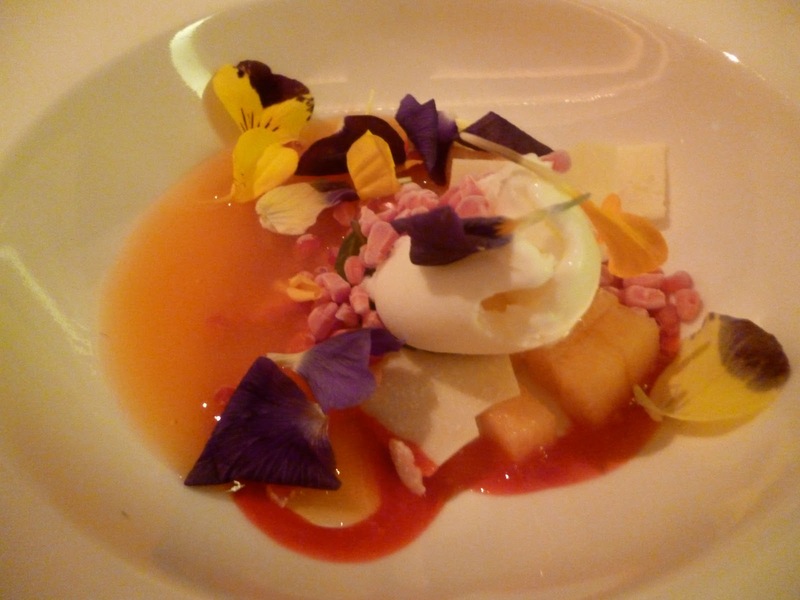 The plate looked exquisite with all the edible flowers floating around. The yogurt was just amazing with all the fruity flavors. I thought this dessert was outstanding. 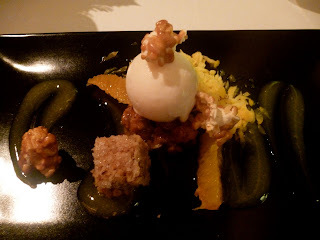 The last dessert was Popcorn, Walnut, Orange, Caramel Corn. This was also very creative and playful. Loved the use of caramel popcorn and frozen orange pulp which really hit the spot for me. 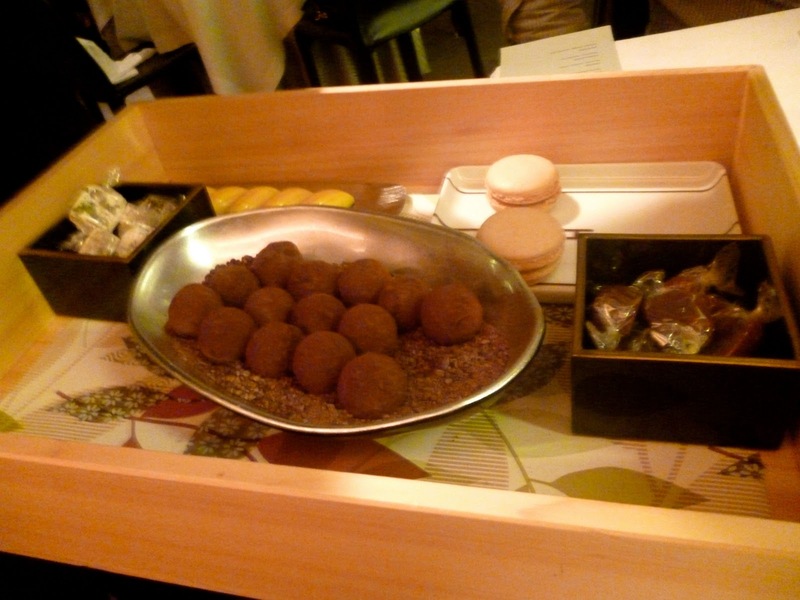 We were served After-Dinner Sweets which I thought looked pretty in a wooden box. Lovely accompaniment to the coffee I had at the end of the meal. At Iggy's, I believe subtlety is the name of the game. Flavors were never overpowering. I may not have agreed with all the dishes, but I commend the creativity and thought process behind creating this degustation menu which was original and imaginative. Definitely satisfied my curiosity as to why this was hailed as one of the top 50 restaurants in the world. However, service was a little on the "average" side I might say. Wait staff was attentive, but very far from the exceptional service you would expect from a fine dining establishment.